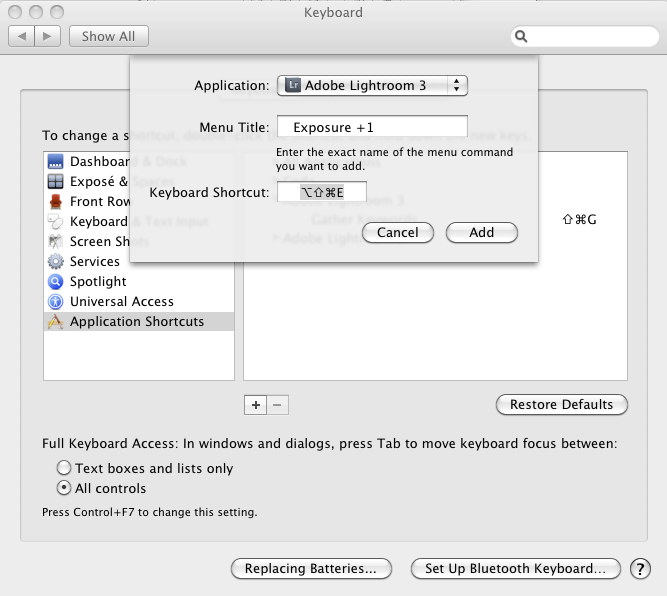 Lightroom doesn't natively provide direct keyboard access to the developments sliders (Exposure, Clarity, etc) other than the ability to incrementor decrement them once they've been clicked on. Keyboard Tamer can add a number of menu commands the the File->Plug-in Extras sub-menu. Each command will increment or decrement the associated setting, no matter which Lightroom module you're currently in. Notice that under Lightroom 4 you'll have the option add menu items to control either the older Process 2010 controls or the newer Process 2012 one. If you don't know what that means, then see Adobe's help page. Type in the name of the menu item exactly as it is presented in the menu. Note that there are 3 spaces before the text that you should include.